Our commercial real estate septic inspections in Orlando include a full inspection of all septic components to ensure complete efficiency and effectiveness. If you are buying or selling a business with a septic system, or if you require routine servicing at your business location in Orlando, Florida, one of the most important services you can request is a commercial real estate inspection. At Southern Water and Soil, we find that commercial real estate septic inspections are critical to any business sale or purchase, and for ensuring the long-term performance of the system over time. Whatever your reason for needing commercial real estate inspections in Orlando, you’ll find our team equipped to provide the expert inspections you require. We can fully assess the function of your commercial septic tank, it’s age and condition, and if there are any signs of disrepair that need immediate attention. Our commercial real estate septic inspections also include a full inspection of other septic components to ensure complete efficiency and effectiveness. We have earned our trusted reputation as a premier commercial septic company over the past 30 years by providing expert services and solutions during every phase of the septic installation, repair, and maintenance process. After our commercial real estate septic inspections, we not only provide the necessary reports and documentation of our findings, but we can also provide the required services should a septic system need immediate attention. At Southern Water and Soil, we like to stress scheduling commercial real estate septic inspections as soon as you plan to buy or sell a property in Orlando, or if you haven’t had your system serviced in some time. 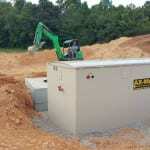 We are here to help you with all your commercial septic needs.